Very handy command. Do you know of a way to use this to regularly report on free space on SSAS? 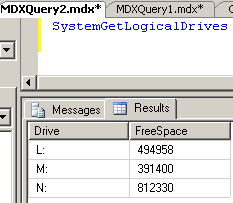 I’m thinking like using it in an agent job that query the SSAS server for free space and logs it or emails it out. I need to be able to monitor the space I’m using on my server – I’m having trouble finding any canned reports out there or anything. Any thoughts? Yes you could execute it using SQL Agent. 2 other ways that i also use are a vbscript that sends an alert when drive space reaches X and i also have a SSIS package using a WMI query that captures the storage stats and stores them in a cube for analysis.